‘Les Cimes des Arbres’ literally means ‘the tops of the trees’, and being set on a ridge, the panoramic views from the gite across the lush green landscape are simply stunning. The gite has been fitted out to the highest standard, with a French style to the furnishings and decoration. Much of the furniture has been sourced from local ‘Brocantes’ and lovingly refurbished with chalk paints for an authentic French ‘shabby-chic’ look. A particularly stunning feature is the elaborate and comfortable king size bed in the Rococo inspired bedroom. The sitting and kitchen area is light, bright and sun-filled due to the double-width French doors opening directly out onto the private courtyard, and the cosy sitting area has 2 leather tub chairs and a wall-mounted flat screen smart tv, dvd player and Freeview box in case you fancy a quiet night in. Panoramic views over lush green landscape. 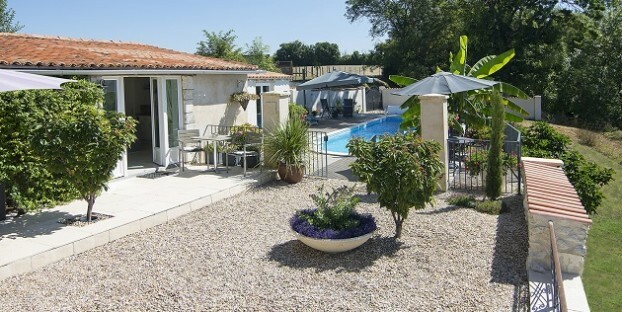 Directly outside the gite there is a private 10x5m heated pool with Roman steps leading down into the pool which is deep enough to swim with ease yet shallow enough to relax in and cool off after sunbathing. Whilst not a true infinity pool, the ground drops away steeply from the front edge, allowing you uninterrupted views even when swimming. A large south facing decked area with sunbeds and parasols runs alongside the back of the pool, plus there is another delightful area under the banana tree which is perfect for al fresco dining. There’s plenty to see and do nearby and the friendly little village of St Severin is just a couple of minutes away by car and has all local amenities you might need. The stunning ‘Plus Beaux Village’ of Aubeterre Sur Dronne, the jewel of southern Charente, is just 5 minutes away by car and has a choice of numerous excellent cafes and restaurants surrounding its tree-lined square. Tumbling down the hillside from the chateau, its cobbled back streets and interesting little artisan shops make it a pleasant place to stroll around and take in the atmosphere. Less than 20 minutes away is the bustling town of Riberac, whose Friday market is one of the best in the area, or in the opposite direction, the Chateau-topped town of Chalais has a busy Monday market. Both towns have large supermarkets plus numerous restaurants and pavement cafes, great for spending lazy afternoons soaking up the French atmosphere. Les Cimes des Arbres is owned by Frances Gleed and her husband Phil who made the move to France in 2014 and spent 2 years renovating their house and the gite. They fell in love with this beautiful area of the Charente after many holidays spent travelling through France. They like that it is less tourist plagued than the neighbouring and better known Dordogne, and is part of a sunny microclimate with some of the best weather in France outside of the Cote d’Azur. They love welcoming guests to what they think is the undiscovered gem of the country.